Founded in 2014, MPavilion is a unique architecture commission and design event for Melbourne, initiated by the Naomi Milgrom Foundation with support from City of Melbourne and the Victorian State Government. 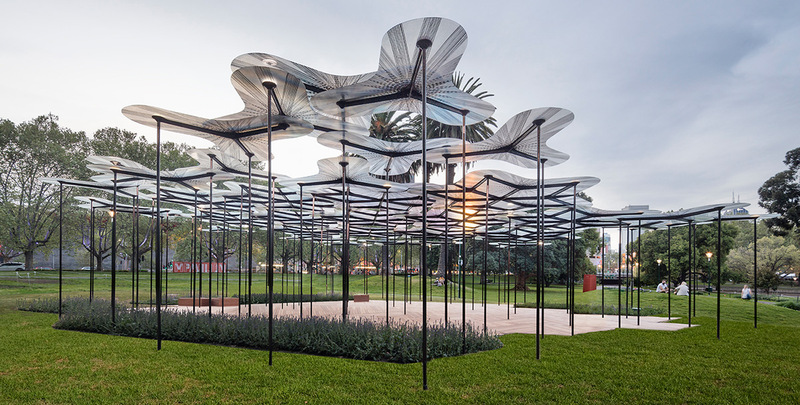 Every year for four years, an outstanding architect will be commissioned to design a temporary pavilion for the Queen Victoria Gardens, in the centre of Melbourne’s Southbank Arts Precinct. An event hub, a meeting place and an invitation to experiment, each MPavilion brings creative collaborators together to present a free, four-month program of talks, workshops and performances from October to February. The 2015 MPavilion has been designed by AL_A, the studio of Stirling Prize–winning architect Amanda Levete. The 2014 MPavilion was designed by Australian firm Sean Godsell Architects, and now has a new, permanent home at Melbourne’s Hellenic Museum. MPavilion’s 2015/16 program has been put together by Creative Director and CEO Robert Buckingham in collaboration with Associate Producer Jessie French, Creative Associate Natalie King, and Dan Honey and Emma Telfer of Office for Good Design.